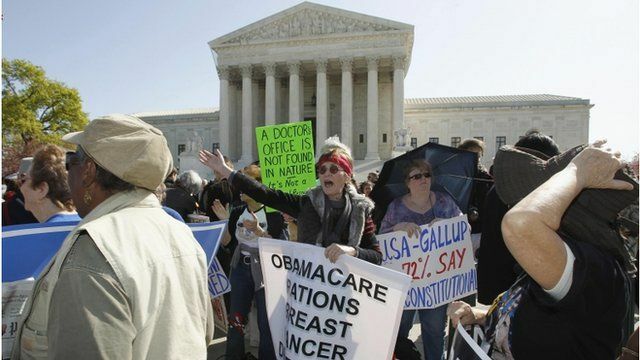 The US Supreme Court has begun three days of hearings into whether the healthcare reform legislation passed by Congress in 2010 should be struck down as unconstitutional. Twenty-six US states have challenged the law, which was championed by the Obama administration. The act expands health coverage to 32 million Americans, but critics, led by the Republican party, say that requiring Americans to buy insurance intrudes on civil liberties. As the hearings began on Monday rival protesters gathered outside the court to set out their stall and make their voices heard.